The following is a list of most of the rebellions that occurred within England during the Plantagenet era. Skirmishes between England and Scotland are treated separately and the War of the Roses is treated as a major civil war rather than a rebellion. In 1173 three of Henry II's son's along with his wife Eleanor, with the help of some rebel barons, attempted to seize power from him. Much of the fighting was in Normandy, and Henry's forces prevailed over the rebels. He eventually reconciled with his sons. Fought 1173, between the supporters of the rebel princes under Robert de Beaumont, and the forces of Henry II under the Justiciary, Richard de Lucy. The rebels were defeated. Henry II Reclaimed kingdoms in England and Normandy after chaotic reign of Stephen. Founded Plantagenet dynasty. John I Wicked king, murdered his nephew and usurped throne. Forced to sign the Magna Carta. The First Barons war occurred shortly after John I signed the Magna Carta, and then refused to abide by its terms. The frustrated Baron's conceived a plan of overthrowing him and invited Louis, the son of the King of France to contend for the throne. John died shortly thereafter, and the Barons changed their allegiance to Henry III, the nine-year-old son of John, because they believed he'd be easier to control than Louis. Eventually Louis was driven from England, and Henry III was made king. Fought in the streets of Lincoln, 1217, between the Royal troops, under the Earl of Pembroke, and the adherents of the Dauphin Louis, under the Comte de la Perche. The Royalists were victorious, and the French leader was killed. Fought 1242, between the French, under Louis IX, and the English, under Henry III, with whom were allied the rebellious vassals of the French crown, the Comtes de Marche and de Foix. The allies were defeated, and Henry withdrew his forces from France. Hubert de Burgh Influential leader of the Barons during the reigns of John I and Henry III. Prince Louis of France Prince of France who was invited, and then disinvited to assume the throne of England. The Second Baron's War is the most famous incident in the long reign of Henry III. Simon de Montfort led a group of rebellious Barons against the king, and after capturing the king at the battle of Lewes, effectively ruled the kingdom in his stead. Montfort's objective was to establish a parliament, and he largely succeeded in this effort even though he was defeated and killed by Prince Edward (later Edward I of England), the following year. In April 1264 Henry III and his forces besieged Simon de Montfort and his men in Northampton Castle. De Montfort mounted a rear-guard rescue but the castle was captured by the King. Fought May 14, 1264, between the Barons, under Simon de Montfort, and the Royalists, under Henry III and Prince Edward. The king was completely defeated, and the two parties signed an agreement, known as the Mise of Lewes, to submit the points in dispute to arbitration. Fought August 4, 1265, between the royalists under Prince Edward, and the Barons under Simon de Montfort. The Barons were taken by surprise, having, at first mistaken Edward's army for reinforcements under young de Montfort, and were totally defeated, Simon de Montfort falling. This defeat ended the Barons' War. Henry III Blundering king whose government lay largely in the hands of Simon de Montfort throughout his reign. Simon de Montfort French nobleman who led resistance to Henry III and laid foundations of English Parliament. Edward I Competent and decisive king of England. Reformed government, pacified Wales and Scotland. Ruled 35 years. Edward II was highly unpopular with most of the Barons and Earls of England because of his tendency to grant power and favors to his personal friends and ignore the wishes of the nobility. This conflict went on throughout his reign, and erupted in several rebellions, and the murder of the most notorious of his favorites. Although in 1322, Edward was victorious against a rebellion led by Hereford, five years later he was deposed, and brutally murdered by Mortimer, an Earl who was romantically involved with his wife Isabella. The throne was granted to Edward III, with Isabella and Mortimer as regents. Fought 1322, between the Royalists under Edward II, and the rebels under Hereford and Lancaster. The rebels, falling back before the king, were surprised by a force under Sir Andrew Harclay while crossing the bridge at Boroughbridge, and were utterly routed. Hereford was killed, and Lancaster, with several hundred barons and knights, surrendered. Edward II Weak and profligate son of Edward I. Lost all his father's holdings in Scotland. Roger Mortimer Earl of March, romantically involved with the Queen. Helped overthrow Edward II. Earl of Hereford Lead of the Barons who rose in rebellion against Edward II. Wat Tyler's rebellion was one of the first peasant rebellions in English history. It was caused by a series of very unpopular taxes and laws, which impoverished the working class. It was triggered by some outrages committed by a tax collector in the region of Essex and Kent. A great number of peasants, led by Wat Tyler and John Ball marched on London and met with the King Richard, who was only 14 at the time. There was some rioting, but it was confined to the property of specifically hated Barons rather than general destruction. The rebels made demands, which the King agreed to. After the rebellion was dispersed its leaders were rounded up and the king reneged on most of his promises. Wat Tyler Leader of a peasant rebellion during reign of Richard II. He was killed during talks. Richard II Son of the Black Prince. Reigned after Edward III. Deposed by Henry Bolingbroke. John of Gaunt Uncle of Richard II who was regent for much of his minority. Richard II came to the throne at a very young age and for most of his youth, the kingdom was in the hands of his uncles and their associates. When he came to power, he replaced their ministers with those of his own choosing. This caused a Baron's revolt, since the new ministers were simply Richard's favorites. The Barons captured Richard, dissolved his ministry, and forced their choice of officers upon him. Fought 1387, between the troops of Richard II, under De Vere, Duke of Ireland, and the forces of the Lords Appellant, under the Earl of Derby Henry IV). De Vere and his troops fled almost without striking a blow, and the King was thus left entirely in the power of the Barons. Henry IV Son of John of Gaunt. Assumed the throne after Richard II was deposed. Henry Bolingbroke had come to the throne after raising and army and forcibly deposing the unpopular Richard II. The only problem was, the presumptive heir to the throne was not Henry IV, but rather, his nine year old nephew. Henry had enough influence to pull of the succession, but his early reign was plagued with plots and rebellions. His most serious foe was Henry Percy, who plotted against him with several co-conspirators including Owain Glynder of Wales, and several others, who sought to further their own ends by deposing Henry, and putting the passed-over prince back on the throne. Bolingbroke managed to defeat his nemesis at every turn, and eventually Percy was killed at the Battle of Braham Moor. Fought July 21, 1403, when the royalists, under Henry IV, met and defeated the insurgents, under Hotspur. Hotspur was killed, and Douglas and Worcester taken prisoners. The battle was the baptism of fire of Henry, Prince of Wales (Henry V), who displayed great bravery, and was severely wounded. Fought February 20, 1408, when Sir Thomas Rokeby, High Sheriff of Yorkshire, defeated the Earl of Northumberland, who had again raised the standard of rebellion in the North. The Earl was slain, and the rebellion subsided. Henry Percy † Earl of Northumberland, and nemesis of Henry Bolingbroke. Led rebels at the battle of Shrewsbury. Although the son of the famous warrior Henry V, Henry VI was a weak and ineffective king, and was unpopular largely do to the perception that he had 'lost France'. Cade's rebellion broke out when a large body of peasants and shopkeepers, with a list of grievances gathered at Blackheath and threatened to march on London. There was rioting and a major battle at London Bridge. They protesters had the support of several squires, MP's and many soldiers who had served in France. It was therefore taken somewhat seriously by the government and an agreement was made to issue pardons, and redress some of the grievances if the crowd would disperse. This was done, but as in previous rebellions, several of the leaders were later hung as traitors. Fought June 18, 1450, between the rebels, under Cade, and the royal troops, under Sir Humphrey Stafford. The force under Stafford was quite inadequate for the work in hand, and was routed, Stafford being killed. Fought July 5, 1450, between the rebels, under Cade, and the citizens of London, under Matthew Gough. The Londoners endeavoured to hold London Bridge, to prevent the plundering expeditions of Cade's followers into the city, but were driven back, and the central drawbridge set on fire. The Londoners lost heavily, among the killed being Gough. 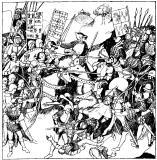 Jack Cade Led a rebellion against Henry VI's government. Rebels looted London and many were killed. Henry VI of England Last king of the Lancaster line. Overthrown by the Yorks in the War of the Roses.